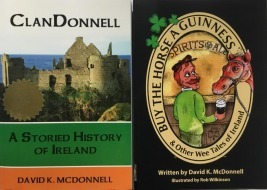 ClanDonnell is now available through the Irish Book Club! The Irish Book Club has an ambitious goal - 'to bring all the great facets of Irish literature to Irish, Irish-Americans, and the world by featuring the latest in Irish authors and books that have anything to do with the Irish experience'. Ambitious or not, we're happy to be in the club. Check out the Irish Book Club at The Irish American News website - then hit the 'Irish Book Club' tab on the top banner. Or go direct to ClanDonnell at this Irish Book Club link. We're also listed in the online bookstore The Wild Geese.